Iran: Nuke talks reach positive "turning point"
ALMATY, Kazakhstan Negotiations with world powers over how to curb Iran's nuclear program have reached a "turning point" for the better after nearly breaking down last year, the Islamic republic's top official at diplomatic talks said Wednesday at the close of two days of delicate discussions aimed at preventing Tehran from building an atomic arsenal. While still guardedly optimistic, the comments by Saeed Jalili, the secretary for Iran's Supreme National Security Council, marked a significant step forward in a years-long process that has been rife with suspicions and, if it fails, could lead to a new Mideast war. The Obama administration is pushing for diplomacy to solve the impasse but has not ruled out the possibility of military intervention in Iran to prevent it from acquiring a nuclear weapon. Jalili said a new offer this week by the world powers to compromise is more realistic than what has been offered in the past. He described the new offer "including some relief from international sanctions" as a step to build confidence between the two sides after similar negotiations in Moscow were nearly derailed last June. "In this round of talks we have witnessed that despite all the attitudes during the last eight months, they tried to get closer to our viewpoints," Jalili told reporters at the close of two days of talks in Kazakhstan's largest city, Almaty, speaking through an interpreter. "We believe this is a turning point." Russian Deputy Foreign Minister Sergei Ryabkov was quoted by Russian news agency Interfax as calling the talks "useful," according to the Reuters news agency. If they offer steps aimed at strengthening trust, this is important, he said. One important step is dealing with a series of crippling sanctions that the U.S., E.U. and U.N. Security Council have imposed on Iran to try to force it to bend on its nuclear program. The sanctions have caused unemployment and inflation in Iran to skyrocket, while depressing its daily oil output and value of its currency, the rial. A senior U.S. official at the talks told The Associated Press the offer included some sanctions relief  but not on Iran's oil and financial industries, where the measures have hit the hardest. The official declined to characterize what sanctions might be lifted, but said a number of the restrictions imposed by the U.S and E.U. would be suspended. Additionally, the U.N. Security Council and E.U. would impose no new sanctions against Iran. In exchange, the U.S. official said, Iran would have to end any uranium enrichment that nears or reaches 20 percent. The official added that Iran would be required to restrict its current stockpile of enriched uranium to that level, which is just a few steps away from being ready for use as a nuclear warhead. Tehran would also have to suspend enrichment at its underground Fordo facility and prevent it from being able to re-start that process quickly. U.N. inspectors also would also be given greater room to monitor Iran's nuclear program, said the official, who spoke on condition of anonymity to discuss the sensitive talks more candidly. The Iranian negotiators "appeared to listen carefully to the offer," the U.S. official said. There was no deadline on when the offer might expire, but the official warned that time is already running out for Tehran to accept it. 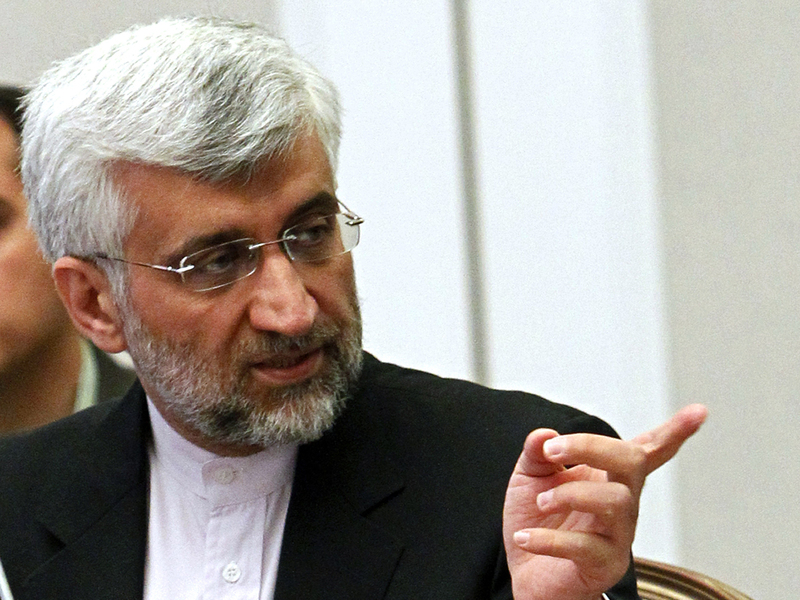 Jalili said the Iranian people remained defiant despite the punitive sanctions leveled against it. Even in the economic area, the pressure they have talked about could not bring the results they were wishing, he said, speaking through an interpreter. He would not budge on Iran's longtime insistence, and a main sticking point in the talks, that it has the right to enrich uranium to 20 percent. "Whatever we need, we will of course pursue that  whether it is 5 percent or 20 percent," Jalili said. "It is important to us to have the 20 percent." EU foreign policy chief Catherine Ashton, who is leading the negotiations, urged Iran to quickly respond to the offer because "we need to see the progress necessary for the confidence the international community needs." "I hope the Iranians are looking positively on the proposals we put forward," Ashton said. "I believe in looking at what the results are." Technical experts for each side will meet in Istanbul in mid-March to discuss the world powers' offer and the high-level diplomats will re-convene again April 5 in Almaty. Senior U.S. diplomats have described technical expert negotiations as an especially useful and practical forum in which to clarify some of the more complex sticking points. Off-and-on talks between Iran and the world powers  the United States, China, Russia, Britain, France and Germany  began after the six offered Tehran a series of incentives in 2006 exchange for a commitment from Tehran to stop enrichment and other activities that could be used to develop weapons. Tehran maintains it is enriching uranium only to make reactor fuel and medical isotopes, and insists it has a right to do so under international law. It has signaled it does not intend to stop, and U.N. nuclear inspectors last week confirmed Iran has begun a major upgrade of its program at the country's main uranium enrichment site. Iran insists, as a starting point, that world powers must recognize the republic's right to enrich uranium. Tehran also has said shuttering Fordo is out of the question and that Iran first wants the U.N. Security Council to withdraw all of the sanctions it has heaped on the nation.